Like the mason last week, I also managed to find a "oh, you could so do this yourself" stove guy. I finally located a stove guy who was willing to take a look at the vintage Tappan Deluxe. I had hoped to have him rewire the stove while it was still partially dissembled...and then make plans to have him calibrate the burners & thermostat later. Well, before I knew what had happened.....he had determined that the wiring was fine. He had explained to me how to set the thermostat. He told me how to get the old gas line off. I had been trying to do this for months. I have no idea why it worked after he gave me instructions, but the old line is off. He had also immediately uncovered the mystery of the knob on the "control panel" below the oven on/off switch (the lowest in the photo - missing a knob)....combined with the box behind it. It is an oven light switch that turns the light on when the oven closes. It had become crooked over the years because it is missing an anchor screw. It was never hooked up because the oven light socket had never been installed. Never in a million years would I have figured that out myself. And he had shown me how to adjust the top burner flame. Also explaining to me how to remove the top burner valve "spud" and clean it. In the photo, you see a little brass nut (spud) at the end of the valve. All four of these were once solid black. I thought they were painted black. Turns out they were dirty (I left the top one dirty in the photo). When I polished them as instructed, they turned out to be solid brass. A little more cleaning of the burner valves & the valve handles is in order, I guess. I had a mason out last week to take a look at the old stove vent hole I have in my kitchen. I've chatted w/ a number of old house folks online that have had this same situation and they suggested calling a mason to rebrick the hole. This was also my intent. It seems I have a knack for calling the guys who are all "I could do this, but.....you could so easily do this yourself and here is how....." The mason was no exception. So, there you are really wanting to pay someone to take care of the problem.....but having enough info. to do it yourself and save a few hundred bucks. The mason instructed me to fill the hole with concrete. The trick was going to be keeping the wet concrete from running out the back of the hole and down the chimney. I pondered this for a few days and then went down to the local hardware store and looked at what they had. It needed to be flexible (so I could get it into the hole). It needed to be either plastic or rust-proof metal. It needed to be about 6"x6". Finally, somehow I had to be able to hold it in place at the back of the hole while I filled the hole with concrete. I was thinking some sort of metal lath - the kind they use for stucco. I found a little, flexible, aluminum, 6"x6" patch that is used for drywall. It had holes in it and a rough surface. It was sticky on one side. Perfect. I tied a long strand of (mint) dental floss to the center. Rolled up the patch and shoved it into the hole. When it was inside the chimney, I used the dental floss to pull the sticky side of the patch flat against the hole. Then I tied the dental floss to a short piece of wood in the inside to hold it in place. Slowly I started to fill the hole with the concrete. When I got about 3/4 the way filled, the concrete threatened to slide out, so I took a piece of cardboard and slide it into place. The cardboard came off easily once the concrete dried. Much to my amazement. The whole process worked smoothly. The hole is filled. Now I need to cover the concrete with plaster. This hole repair will be behind the new kitchen cabinet. Just a quick hot tip. For those of you even thinking about restoring/repairing your old windows, the book Working Windows by Terence Meany is on sale for $14.41 now until 6/30/09 via Old House Journal. This book is the Bible of window restoration. It frequently sells out & goes out-of-print. So, if you have a chance to buy it (on sale no less), I'd hop to it. I have a well worn copy in my house. Well, that was fun. Went out to turn off the water sprinkler. Got to the outdoor spigot & realized that I had shut my front door. Not a problem. Unless you have a door that automatically locks itself and you left your key inside. Heavy sigh. I managed to snag my neighbor as he left his house for a walk and ask to use his phone. Now last time I did this I created 1000 copies of my key and gave them to friends and family. 999 of those key people had left town for the long weekend, the remaining one was online via dial-up. So, I once again called my favorite locksmith. I've locked myself out of my house 3 times since I've lived here. Not sure exactly what my problem is. You know you are in trouble when they recognize your name. Well, $85 later I am back in my house. I paid with credit card so at least I get frequent flier miles. It's been one of those weeks where I long to have one of those design blogs where I get to post bright & shiny pictures and agonize over where my freshly cut flowers will be placed (although I do have lilacs in the house). Alas, I have a restoration blog. My pictures are dark & dusty...and so am I.
I finally got the hole in the plaster of my kitchen ceiling filled in. This is not a pretty fix. It's purely functional. I wanted to repair the hole, but it will ultimately be covered with ceiling tiles. If a future owner decides to remove the tiles & the furring (added by a PO), they will need to completely redo the plaster. So, it didn't make a lot of sense for me to agonize over getting the finish coat all smooth & pretty. I will admit, though, it was a tiny bit hard for me not to make it perfectly smooth. I also went out and bought the tin-type tiles. I'm still fine with this decision (even I am kind of surprised by this). They do contradict my old house purist sensabilities. But, I also figure they are a reasonable solution and "do no harm." I will be making the kitchen ceiling better than it was...and will not be adding any additional work if a future owner wants to fully restore. Besides, I think they are cute. About this time each year, I like to link to the Minneapolis walking tours. Here are the 2009 tours. There are a ton of them this year covering historical & architecturally significant neighborhoods, buildings, a cemetery, a church & homes! If you take one of the tours, post a comment on what you thought. My vegetable garden is in. 12 tomato plants, spinach, beans, zukes, rhubarb, potatoes, brussel sprouts, peppers, asparagus, marigolds and assorted herbs. Damn. 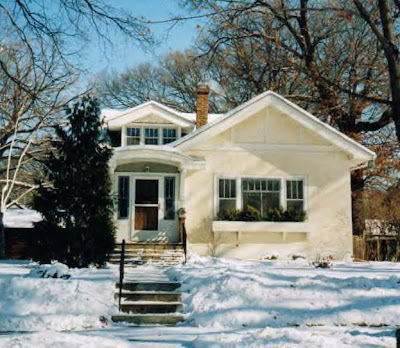 The Twin Cities Bungalow Club Tour is canceled this year. I'm going to miss it. It's always fun to go through other people's houses to get ideas. For those of you also going through withdrawl, I'm going to try a little experiment. Let's see if we can get them to link to some more old house/bungalow blogs for us to follow. UPDATE: Ha, well my fellow bloggers have not disappointed! Both Bunglaow 23 & Foxcroft have risen to the occassion with excellent entries for our little virtual tour.....and more tour recommendations for you to follow. Now, I am shamed by their excellent posts to update my tour entry. Stuccohouse was build in 1924. It was built as a typical middle class bungalow. I bought the house in 2002 and started blogging in 2004. This post will give you a short introduction to my adventures. One of my favorite projects has been restoring my vintage, old-growth, double hung windows. One of the things I most appreciate in my house is a built in buffet. I'm currently restoring my vintage kitchen & an old Tappan Deluxe stove. Please feel free to browse the rest of my old posts, ask questions and post comments!